The Recipes | Eat Sleep Cook! I’ve written, roughly, a recipe a week to go with my weeks at School. 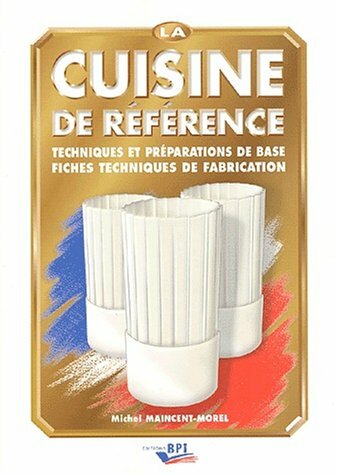 The recipes are usually taken from whatever it was I was cooking that week and are based on those in La Cuisine de Référence by Michel MAINCET-MOREL, the set text cook book for my cooking classes. I have tried to simplify and explain them, and there’s a progression throughout the book – learn how to make your stocks first, then dishes and sauces which use them. There’s also some advice on how to cook more like a professional. In one way it’s not hard – cooks use a lot of common sense, a lot of elbow grease and only a little imagination. Equally, it’s very hard because most people just don’t cook that way at home. It’s a big mistake to think that you need a big kitchen with lots of professional equipment, expensive knives and tools. You don’t. All the great chefs I’ve worked with use a couple of knives in their daily work – one big, one small – and can do everything they need to on a worksurface about one metre by one metre. At home now that’s what I have; a small kitchen, a metre-square worktop and I use a small vegetable peeler knife for small things and my big 25cm chef’s knife for everything else. Just keep them sharp and you’ll be fine. I have three saucepans, one of which I never use, a frying pan, a wok, some silicone madeleine molds and a mandoline. The latter I use normally only when I’m making chips because I’m too lazy to cut them by hand. Oh, and a stick blender too. A cheap one. My blender and Robot mixer are both broken and have been for a couple of years. I don’t miss them. Concentrate on your ingredients, not the shininess of your kitchen equipment, and everything will taste better. Promise. Also, stop cooking everything for so long – this is the biggest single fault I see in home cooks – everything’s left in the oven or on the stove for too long. Remember that most things will continue to cook when you take them off the heat. So take that into account.